Koi Princess is an online anime-themed video slot from the creative minds at Net Entertainment. The slot game is presented on 5 reels with three rows and features 20 fixed pay lines. Net Entertainment is not usually associated with tons of extra bonus features, but this incredible video slot makes up for it with random base game bonuses and mini-games that should keep you well-entertained. 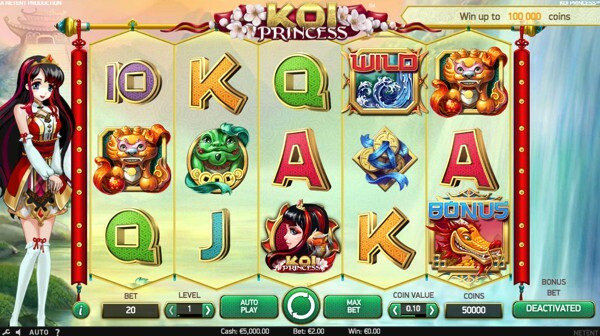 Koi Princess also features wilds, scatters, bonus symbols and a top paying jackpot bonus worth 500 coins up the taking. The background consists of a beautiful oriental landscape with a waterfall displayed on the right-hand side of the reels and a gorgeous oriental temple located on the left-hand side of the reels. Koi Princess has a total of four high valued symbols that are well-designed and include a stylised dragon, the Koi Princess logo, a green turtle and two Chinese coins wrapped in a blue ribbon. The lower valued symbols consist of 10, J, Q, K and A to complete the set of standard symbols presented on the reels. Koi Princess has an outstanding selection of betting options available below the reels to accommodate any type of slots enthusiast. The coin denominations range from as little as £0.01 and can reach a maximum of £1.00 per pay line. There are also 10 different bet levels with the minimum bet per spin starting at £0.20 and peaking at a maximum of £200.00 on a single bet. The breaking wave icon acts as the wild symbol while the golden dragon’s head represents the bonus symbol in the game. It will match all regular symbols, and any possible wins will be completed and awarded. The bonus bet is ultimately an optional extra, costing you double your total bet. Activating it will increase your chances of triggering the bonus features and one of the random features. In addition, it will also increase the pay outs in certain parts of the bonus game. 5-Hit Random Feature: Receive one free spin that will guarantee you a five-symbol win. Random Wild Feature: Receive one free spin with up to 9 extra wild symbols. Wild Reels Feature: Receive one free spin with up to 5 reels being completely wild. This is activated by displaying three golden dragon bonus symbols on reels one, three and five. If you manage to display two golden dragon bonus symbols, you might be lucky enough for the third one to nudge into place. There is a total of four bonus games on offer, and you simply need to spin the wheel at the bottom of the reels to be awarded one of them. Sure Win Free Spins: You will receive 10 free spins with a guaranteed win on each spin. Wild Reels Free Spins: You will receive 10 free spins and on every spin between 1 and 5 of the reels will be completely wild. Bonus Wheel: Much like the Wheel of Fortune, you stand a chance to win coins, or you can trigger one of the two free spin features. Coin Win: You will receive an instant coin value win. Koi Princess doesn’t feature the best graphics, but it certainly blends the gameplay with the anime design very well. The endless list of incredible bonus features will keep you on the edge of your seat for the duration of your stay, and with the slot game featuring a medium to low volatility level, you will receive frequent pay outs with some decent coin values to keep you playing for longer. The Return to Player has been set to 96.00%, so you can except a fantastic time on this slot game. We have embedded a demo version of Koi Princess below. You will also find a couple of recommended casinos that has the casino game.